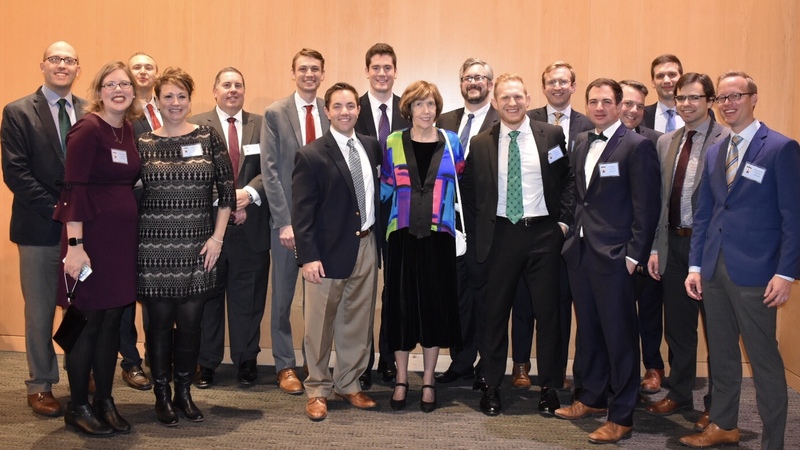 Dreary weather did nothing to dampen the warm and festive spirit inside Salisbury University’s Guerrieri Academic Commons Assembly Hall on December 1, 2018, when the Wicomico County Bar Association (WCBA) hosted a retirement celebration for the Honorable Sally D. Adkins of the Court of Appeals of Maryland. The event drew approximately 175 active and retired judges and lawyers from across state, the veritable who’s-who including Chief Judge Mary Ellen Barbera, Court of Appeals of Maryland, District Court Chief Judge John Morrissey, newly retired Court of Special Appeals Chief Judge Patrick Woodward, Bar Counsel Lydia Lawless, and University of Maryland Francis King Carey School of Law Dean Donald Tobin, as well as many of Adkins’s former law clerks. Wicomico County Assistant State’s Attorney and WCBA President Andrew Illuminati (pictured above, at left, with Judge Adkins and WCBA President-Elect Gil Allen) lauded Adkins’s steadfast devotion to her Eastern Shore roots. “She was always available, and always attended our local bar holiday parties,” he added. Adkins became the first female judge on the Wicomico County Circuit Court with her appointment in 1996. Two years later, she was appointed to the Court of Special Appeals of Maryland, where she served until her elevation to the High Court in 2008. Adkins retired from the bench on October 30, 2018, after a decade of service on the Court of Appeals. “We’re very appreciative of Judge Adkins’s service to the judiciary and to the state of Maryland, and we wish her well,” said Steven Rakow (pictured above, at left, with Salisbury attorney Russell C. Dashiell, Jr. and Judge Adkins), who represents the Second District (Dorchester/Somerset, Wicomico/Worcester Counties) on the MSBA Board of Governors.